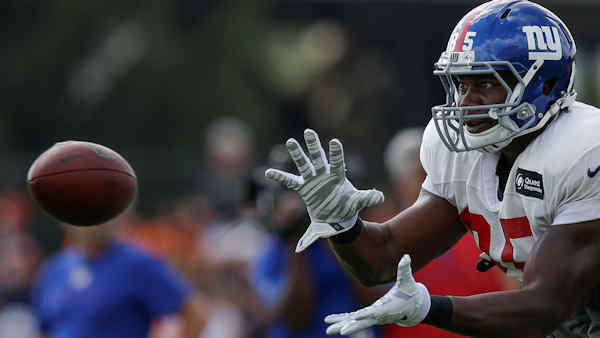 EAST RUTHERFORD -- New York Giants coach Tom Coughlin said his team dedicated Sunday night's comeback victory to tight end Daniel Fells, who remains in the hospital battling MRSA and is out for the rest of the season while he undergoes treatment for the dangerous staph infection. "We dedicated the game to Daniel Fells and his family and thank God we were able to give him that game ball," Coughlin said at the beginning of his postgame news conference, moments after Eli Manning threw a game-winning touchdown pass to tight end Larry Donnell to give the Giants a 30-27 victory over the San Francisco 49ers. "That was some football game tonight, and to have a guy from his (meeting) room go up there and make that catch at the end of the game was just incredible." Coughlin visited Fells in his hospital room Saturday morning and said he found Fells in good spirits following a week of treatments, procedures and high fevers. When Coughlin spoke to the team Saturday night, he told them the plan was to win the game for Fells. The Giants have a ritual where they point one finger upward in the fourth quarter to signify that they want to "take it to the next level," and the message this week was that that gesture would carry a specific meaning. "Tonight, it was, 'Take it to that next level for Fells,'" Giants cornerback Prince Amukamara said. "He was in everybody's hearts tonight." Fells' condition is serious, and a report Sunday morning indicated he is in danger of losing his foot. The Giants' players and coaches have been very concerned about him and have been checking in daily since they learned of his condition about a week and a half ago. "He's had two very good days in a row," Coughlin said. "The MRIs have come back without any issues the last couple of days, and hopefully, he'll continue in that direction and he can go home and see his kids." Shortly before Sunday night's game, Fells tweeted a message of encouragement to his teammates from his hospital bed.